::Download Assessment Report:: The Assessment of the Environmental Performance of Solar Photovoltaic Technologies has been developed by Environment Canada, in partnership with Natural Resources Canada’s CanmetENERGY and with input from Task 12 “Photovoltaic Environmental Health and Safety” of the International Energy Agency’s Photovoltaic Power Systems Programme and several Canadian researchers and industry stakeholders. The assessment is designed to enhance the scientific and technical understanding of solar photovoltaic technologies in Canada and to help support development of effective public policy, regulations and federal investment decisions. Where possible, this assessment provides an understanding of the relative environmental impacts of various electrical power sources, which is essential for development of sound energy policy and allocation of funds to strategic research priorities. Mitacs is pleased to announce a new international funding opportunity. The Mitacs Globalink Research Award provides funding to support student research projects abroad. For more information, please visit the Mitacs Accelerate webpage or contact your local Mitacs Representative. Energy Entrepreneur Challenge – calling all Ontario university and college students…. The OCE’s David McFadden Energy Entrepreneur Challenge is open to university and college students from across Ontario. Application Deadline is January 31, 2014. The OCE invites eligible students to address challenges facing the energy sector. Up to 10 finalists will be selected to pitch their idea at OCE’s ‘Discovery’ trade show and conference on May 12 to 13, 2014. The winner receives $25,000 and a suite of business services to assist in advancing the business concept. The theme for this year’s Challenge is “Enlightened Energy”. View the promo slides here, and find out further details at this weblink. Hurry, the deadline is fast approaching! The Fall/Winter 2013 Issue from CanSIA is Here! 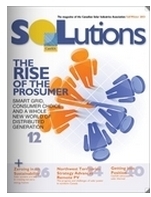 This edition of SOLutions magazine is all about a force shaping the current solar industry market – a proactive consumer referred to as the “prosumer.” In the cover story, CanSIA examines how the rapid penetration and adoption of renewable energy, solar PV in particular, and modernization of smart-grid technologies are a result of electricity consumers demanding tools and services that will allow them to manage their electricity consumption and costs. They also highlight how one retailer, IKEA, is taking steps to market to this growing segment of the energy-focused consumer and then discuss the movement towards net-zero energy homes. Smart grid, consumer choice and a whole new world of distributed generation are helping change the direction of solar. ::Download Technology Report:: The International Electrotechnical Commission (IEC) Market Strategy Board (MSB) released its report entitled “Nanotechnology in the sectors of solar energy and energy storage”. The report outlines the aspects of solar energy and EES (electrical energy storage) to be most influenced by nanotechnology and nanoscale materials. It is particularly useful for those planning, designing, organizing or regulating in these two fields. Prepared by the IEC Market Strategy Board by the Fraunhofer Institute for Systems and Innovation Research ISI.